This weekend, the Concordia men’s soccer team defeated the UQTR Patriotes 2-0 in their home opener. Striker Andrew Bryan opened the scoring in the 61’ minute. Substitute Claude Diesse scored in stoppage time to ensure the victory. The Stingers kept the same starting lineup from their loss at U de M on Thursday. Nicholas Giannone started in goal. His back line consisted of Michael Al Tork, Ramin Mohsenin, Christopher Mirasyedi and Enos Osei. Eduardo Mazzonna, Gonzalo Paredes, Fabian Troche and Sammy Tork completed the midfield with Anasse Brouk playing behind Bryan up front. The Stingers had the first chance in the 12’ minute when newcomer Bryan missed his header attempt. The visitors almost made Concordia pay for the early miss. In the 21′ minute, UQTR forward Valentin Seger was advancing against keeper Giannone. Seger ended up blasting his shot over the bar. In the dying moments of the first half, the visiting Patriotes almost opened the scoring. Stingers goalkeeper Giannone was forced to make a terrific diving stop. The action got off to a quick start in the second half. Four minutes in, the maroon-and-gold were awarded a penalty kick. 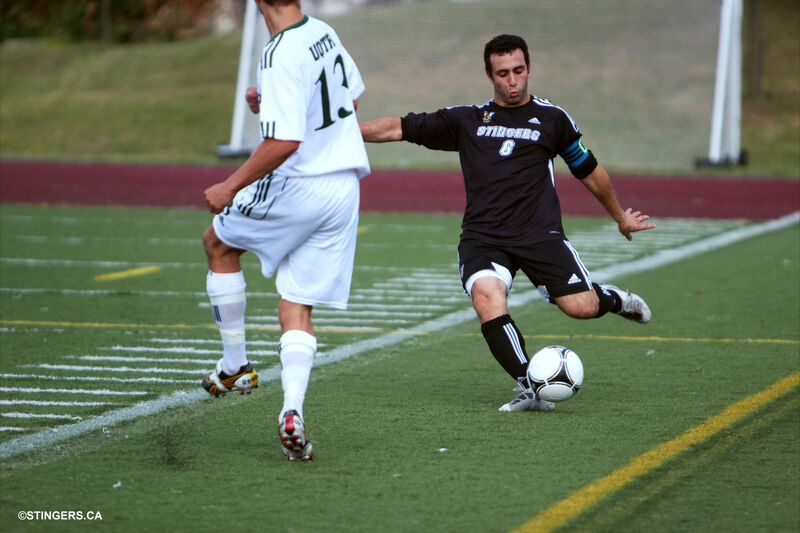 Brouk stepped up to take the spot kick, but his shot was saved by UQTR goalkeeper Raphaël Bélanger Vaillancourt. Two minutes later, Brouk almost redeemed himself. After being played through, the Stingers forward decided to square a ball for on-rushing substitute Jose Prida. The play was broken up by a Patriotes defender. On the hour mark, UQTR were inches from finding the goal. Concordia defender Enos Osei made a last minute block to deny any scoring chance. One minute later, Bryan found the back of the net at the other end of the pitch. Diesse’s perfectly timed through-ball found the Stingers striker, who calmly curled a shot to the bottom right corner. In the 71′ minute, UQTR midfielder Yannick Fournier tested substitute Stingers goalkeeper Remo Taraschi with a strong shot. Taraschi was able to make a strong save. The Stingers got stronger as the game concluded. Diesse and Amadou Lam missed great chances to put the game away with their one-on-ones with the Patriotes keeper. Concordia eventually iced the match when Diesse converted a breakaway. The team played a strong match from start to finish. On defense, they were organized, applied lots of pressure on the ball and were able to recover after UQTR misses. With possession, the Stingers moved the ball fluidly and outside midfielders played wide to stretch out the field. The squad seemed confident and was able to create many chances. Bryan, who scored his first goal in a Stingers uniform, said he was very pleased with his goal and the result. The team will play again on Friday, Sept. 14 against the McGill Redmen at home. Kickoff is scheduled for 6:30 p.m.